The air conditioned (both heating and cooling) apartment is furnished to be your second home, and not just another rental, with all the features you would expect to find in your neighbor’s house. The first room on your right is the fully stocked kitchen, for those of us who love cooking. All appliances are brand new, and include a dishwasher, as well as a washer and dryer. A small kitchen bar offers a place to hang out for a drink while the food is cooking. Straight ahead leads to the dining and living room. The living room has everything you need to entertain your friends and family, with a 42” TV, sound system, Playstation 3 with a Bluray and DVD player, SKY Satellite receiver, movies, board games, cards, books, and a sofa-bed that can comfortably sleep two. On your left is a bedroom with a garden view window, closet, two queen beds (a regular one, and a bunk bed above that is queen size. Next to it is a bathroom with a marble shower with views of the garden. Ahead to your left is the master bedroom, with its own closets, and an in suite master bathroom, enjoying a double marble sink, and a candle-lined tub, for your moments of complete relaxation. Accessed from either the master bedroom or the living room is the terrace / balcony. A portion of the terrace is enclosed with fold-away glass walls, and houses the large outdoor dining table for 8, as well as the optional 3rd bedroom (sofa-bed for 2 with glass and heavy curtain walls), which can also be enjoyed as a day-room away from the direct daytime sun. The terrace also features a private spa / hot tube / Jacuzzi, from where you can enjoy a bottle of wine, while watching the last of the sun’s rays fade. The terrace has views of both the sea and the mountains. The apartment is located on the 2nd floor, or what is referred to as the 3nd floor in Northern Europe and the US. The 35 square meter balcony/terrace has a large section enclosed with a glass wall, that can easily be slid to one side, to open the entire area up to the sun. For the winter evenings, the glass can be put in place, and the terrace be fully enjoyed, with heaters, if necessary. 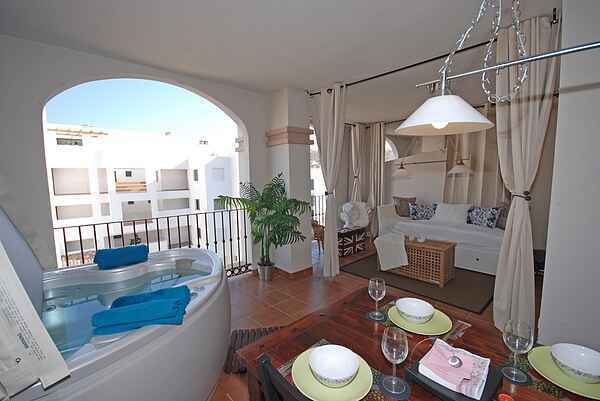 The private Jacuzzi is located on the terrace, out of view from the rest of the units, for a more private experience. Further details In the interest of making the holiday as relaxing and enjoyable as possible for those traveling with babies and toddlers, we have gone the extra mile for you, by providing the items you need the most, and which can be such a chore to transport. These items include: extra bibs, sterilizers, a cot, folding high chair, child-proof plugs, a folding baby bath, baby monitors, push chair / stroller, and a universal insect net to protect your sensitive little ones. There are so many facilities in the local area that you will never run out of things to do, with or without a car. La Cala de Mijas still has that small town charm and feel, yet the sophistication and amenities of a modern city. Every Wednesday and Saturday you can walk to the local market, where you can purchase anything from fresh produce, to clothing, jewelry, and everything in between. There are Irish Bars, English Bars and Spanish Bars, all within a few blocks of each other. You will find restaurants and retail stores up and down the narrow, cobble stone streets. A 10 minute walk will take you to an amazing beach, with miles of the Costa del Sol’s finest sand. A pirate ship playground is located along the beach walk promenade, and it is a big hit with the kids, when they need a break from the ocean. Two modern grocery stores are within easy walking distance of home. Take either public transportation or a car for a 10 minute drive to the enormous local shopping mall (Parque Miramar), with over 160 shops (including the likes of H&M, Zara, and Blanco) and a multiplex theater with 12 cinema screens. La Cala de Mijas was once home to the Moors, and you can still tour the many castles, walls and towers that are left behind as a part of Spain’s rich and vibrant heritage. The apartment is situated in the Golf Valley, with 9 excellent courses, including The famous La Cala Golf, Mijas Golf, Mira Flores Golf, La Siesta Golf, La Noria Golf, Santana Golf, Calanova Golf, and El Chapatral Club de Golf. For those who enjoy horse racing, do not miss a wonderful and exciting day at the Hipodromo Costa del Sol, just a 5 minute drive away. Strictly no smoking anywhere. The balcony is enclosed, so no smoking there either. Refundable breakages deposit of £100 required before arrival, to be refunded within two weeks of your departure (subject to satisfactory property inspection). 20% of rental fee due four weeks before your stay to secure booking. There is a lift in the apartment building providing wheelchair access.